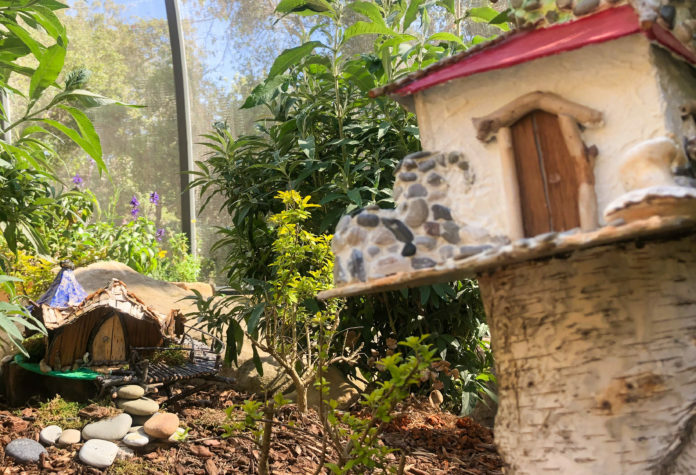 Since the butterflies in the Santa Barbara Museum of Natural History’s beloved Sprague Butterfly Pavilion cannot stay year round, the museum has transformed the area into a temporary, collaborative exhibit called Fairy Village. In order to encourage the community to interact with this space, the museum is encouraging visitors to create little houses to add to the core Fairy Village exhibit. Entry to the space is included with regular museum admission, and anyone is allowed to participate as long as they follow the fairy housing code. Fairy Village’s designer and contractor, Simon Allen, explained in an interview with The Bottom Line that the idea of community engagement with the museum was partly inspired by popular response to a contribution of his own. Six years ago, Allen hid a garden gnome in the — then temporary — butterfly pavilion when he served as the butterfly exhibit’s manager. “Somehow, spontaneously, people started bringing in gnomes, and by the time we tore the exhibit apart, there were hundreds of gnomes hidden around — and nobody knows how it started,” Allen said. This spontaneous involvement offered promising opportunities for future collaboration with community members. Once the pavilion became a permanent structure, Allen and the other members of the Fairy Village team decided that they would build a core village, hoping that visitors would come and contribute to the outskirts. Fairy Village has been met with similar enthusiasm and engagement as the spontaneous gnome project. Community members have started blogs to organize little house construction, and some visitors have even created houses on site using the natural materials found around the museum. Allen explained that, from the beginning, his intent for this exhibit was to “think like a fairy,” and this included the consideration of what house-building materials fairies would have access to. This led to the decision to limit the type of materials used to only natural materials. When asked about his hopes for this exhibit, Allen said that he feels he and his team have achieved a great deal. “I think we achieved our goal, which was to get people involved, and get them in the pavilion,” Allen stated. While it is possible that Fairy Village could become a seasonal exhibit, there is no guarantee that it will return. The installation will, however, be around until April 28 — so visitors are encouraged to contribute their creations soon before the opportunity flies away.